Counting Board-Place Value is designed to help build mathematical foundations in children aged 4-8 by using a concrete, visually significant material inspired from the Montessori methodology. 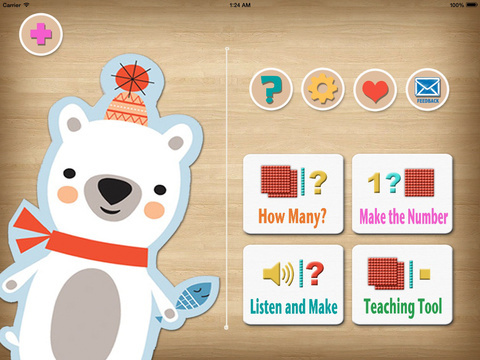 It compliments the use of hands on expriences for building, modeling numbers. 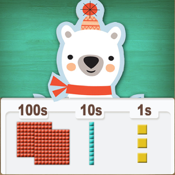 This section provides Multi Base Blocks(BASE 10 Blocks), a removable place value chart, removable number display and removable random number generator for playing games. The teaching module is to be used with a teacher or tutor with interaction to discuss or investigate real problems. 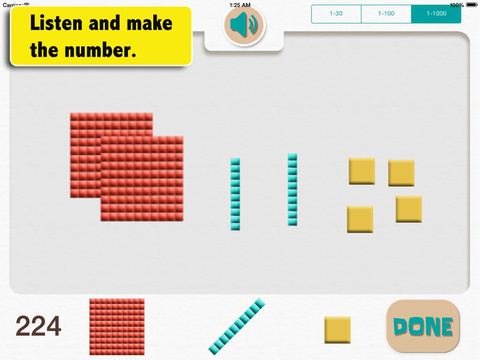 Read the numerical number given and use the Multi Base Blocks at the bottom of the screen to model the number given, pressing the answer button when finished. Three levels, Level 1 to 30, Level 2 to 99, Level 3 to 999. MAB is at the bottom of the screen, students must placing theMulti Base Blocks in the correct position on the Place value chart. They then key in the correct number or the keyboard (promoting calculator skills). There are three Levels of increasing difficulty. Attempts to address numbers in which students make place value errors such as reversals 17 for 71, or omissions 420, 42 for 402 ,3009 for 309 and mishearing 16 for 60. Students listen to the number then drag the MAB onto the place value chart in the correct position, pressing answer when complete. Three levels of increasing complexity. • Three levels, Level 1 to 30, Level 2 to 100, Level 3 to 1000.